Craig Belcher with his new mango classic. 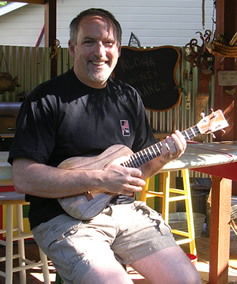 We had a great time getting to know Craig at the 2009 Portland Uke Fest! 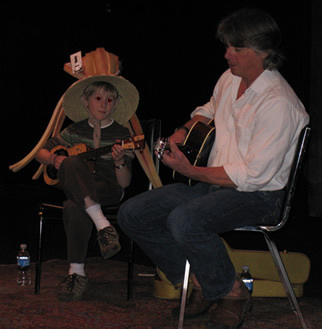 Matthew McCravey plays a Mya-Moe Pau Rosa Resonator (donated to the 2009 Gorge Fiddle Contest) with local luthier & musician, Paul Lestock. Steve bonded with the not-too-shabby Fiddleback Mahogany Classic complete with snappy rope binding. 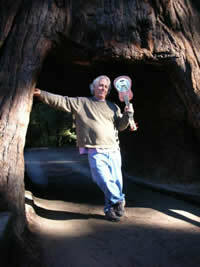 Moe Dixon with his koa resonator literally in the redwoods! 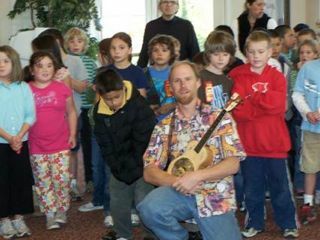 Here's Paul Blackburn, local uke instructor, with the May Street School 3rd Graders in concert at the Parkhurst House. 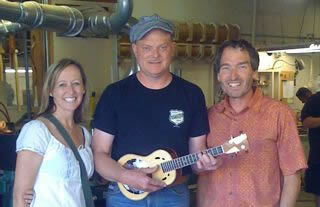 Don Young, owner of National Reso-Phonics, with his purpleheart resonator. 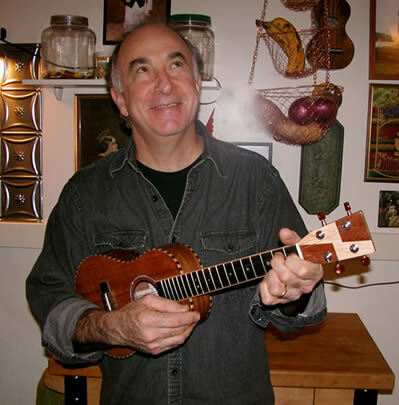 Don's latest email about Purple Uke: "Other instruments at my house very jealous of Purple Uke. "Big Fishy" our pet goldfish, really likes Purple Uke. When I play it he starts spinning and flipping around his tank."